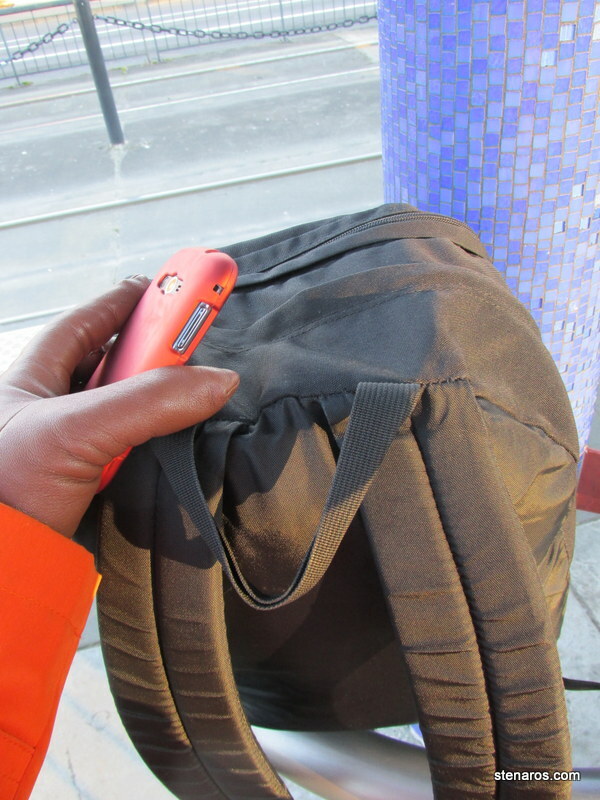 Where am I headed on a cold winter day? To Caravan! 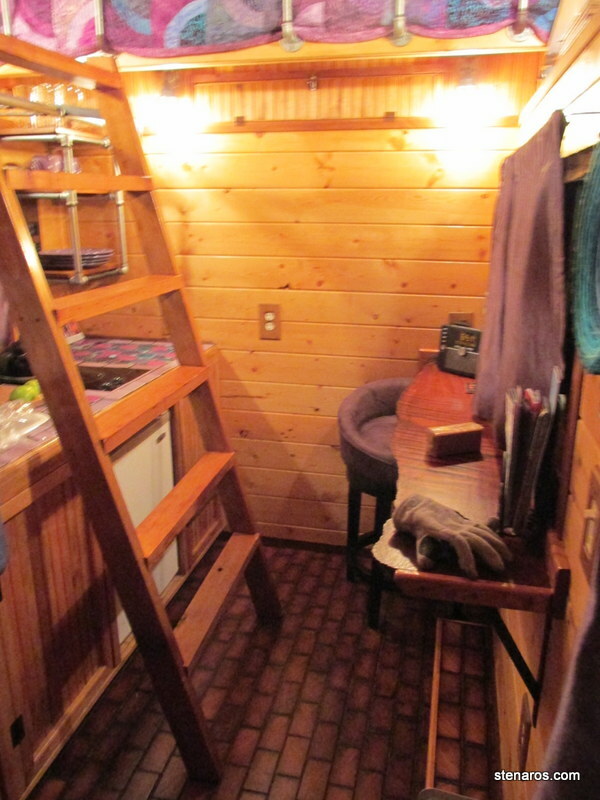 My friend Deborah gave me a stay in a tiny house for my birthday. 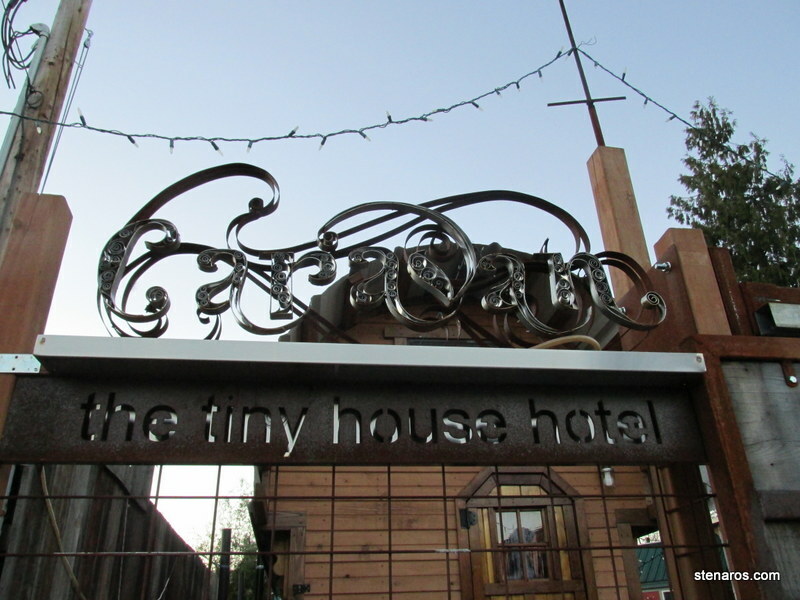 Caravan is the first tiny house hotel in the USA. 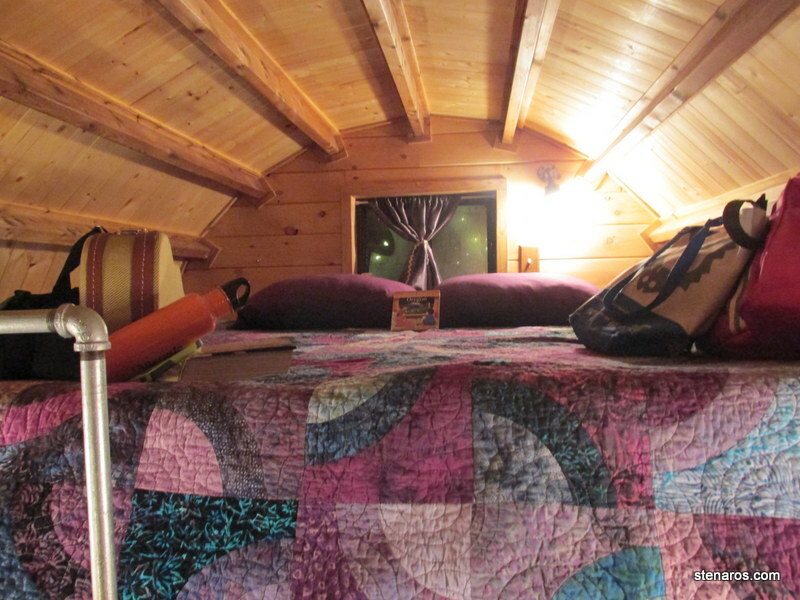 We stayed in the Roly Poly, which is 80 square feet. Here’s the main section. The ladder stores on the wall when not in use. Standing against the ladder wall you can see the house from the other direction. I was particularly enchanted with the string art. Additional storage space built in under the lofts. Deborah playing the uke. A tiny guitar for a tiny house. 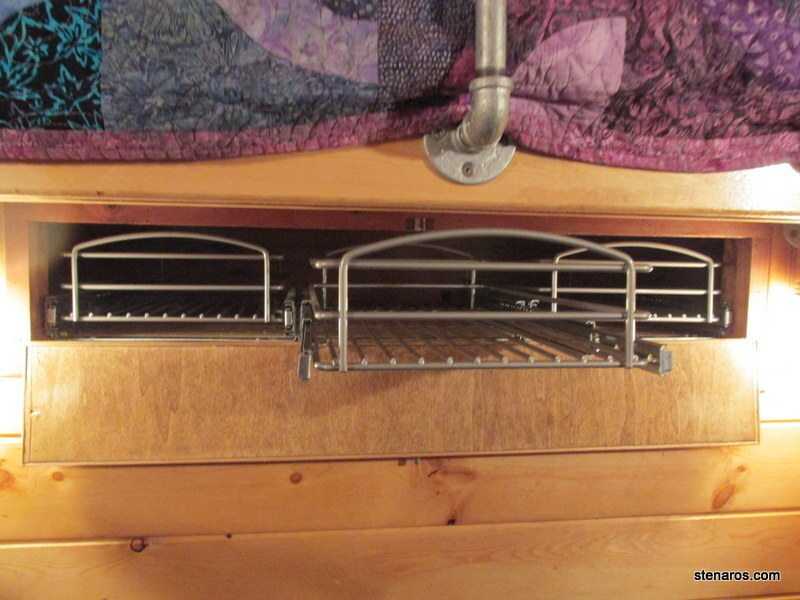 Storage space above the kitchen. After warming up the soup dinner brought by Deborah, we spent the evening chatting, her on one loft bed, me on another. Deborah tried out different songs from a new songbook. I caught up on the newspaper. Around 10:30 we got hungry and ordered room service from the Radio Room, a restaurant across the street from Caravan. Delicious pork tostadas were consumed. 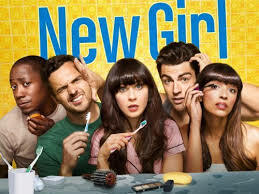 Oh this show, with its excellent intermittent physical comedy and engaging characters. I think Jake Johnson imprinted on me from Drinking Buddies, so I was quite happy with the developments in this season. Although I can see it might get annoying in the third season. Julie came over for a day of sewing and she helped me lay out the material. So it was speedy, taking us only 10 minutes. She also got to see first-hand how lazy a sewist I am. “Aren’t you going to line up that grainline?” she asked at one point. I shrugged and she adjusted it. Here we are 90 minutes in and it’s looking like a robe. The material is this great fabric I got from Rose City Textiles in their bargain room. This was also the point in which the directions and I became estranged. The way I was reading the instructions for the cuff ended up not making much sense, so I finally just added the cuff the way I thought it would work. And done! I really like it! It’s very soft and cozy and is the perfect length for a robe. And here is the final tally. Although you have to add the hour I spent taping the pattern. 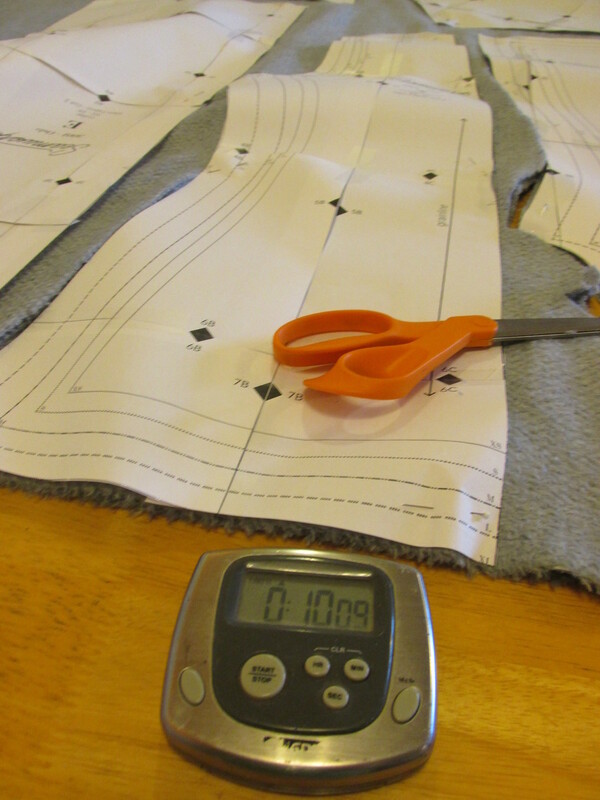 But I still consider four hours “an afternoon.” Color me happy, Seamwork. I also added snaps to the front to keep it closed. Worked great. I’ve subscribed to Seamwork, a digital sewing magazine. The magazine is free, and if you subscribe ($6.00 per month) you receive two patterns each month. Each pattern is designed so it can be completed “in an afternoon”. 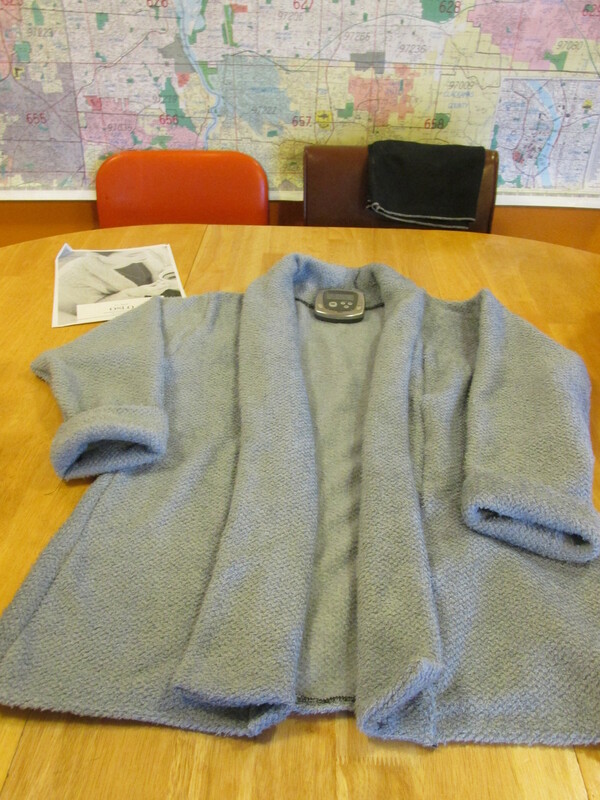 I aim to make the Oslo Cardigan, although I’m going to use it as a robe. Let’s see if indeed this pattern can be completed in a timely fashion. Below, Sentinel observes the detritus from too many projects. The pattern comes in two forms. A digital file that can be printed at a copy shop, or a file that can be taped together. I didn’t make it to the copy shop, so taping and cutting I am. I did this the night before I set to sewing, and forgot to start the timer, but I think the taping and cutting took about an hour. It’s been appearing on a lot of top ten lists and I and the critics are in agreement! Aside from having two (count ’em TWO) actors who were also present in Veronica Mars season two, this was an engrossing, amusing and gently satirical. If you are a white person looking for a peek into the world of being a black face in a white place, this movie is well worth your time and if you are just out for a well-crafted movie, this is also your movie. Visiting the Academy Theater for my movie, I noticed these framed telegrams from different Hollywood stars of yore. Here we have Bing’s good wishes. I liked this one from Bob Hope, mostly because the telegraph operator transmitted “Bob reguards Hope”. This is from Heather, who picked out this card because the back also had a picture of the Graceland Kitchen. Which is fab, I agree. I’m not eating one of those sandwiches, though. Nuh-uh. You can’t make me. This is from Sara, who got it while Christmas shopping at the Kate Spade store. It’s pretty, especially for an advertisement postcard. What to do when you spill kombucha all over your library book. After you stop swearing and rushing about to move other things out of harm’s way and wipe up the spill, of course. If you multitudes of pens handy (which we do thanks to Matt’s absentminded kleptomania) you can space the pages out so they can dry. It works pretty well. Posted on December 25, 2014 April 29, 2015 Categories Books2 Comments on What to do when you spill kombucha all over your library book. Postcard from Graceland, by way of Texas. This is from Heather, who bought it for me because she thought I would like the informational part and I did! Graceland is at 3764 Elvis Presley Blvd in Memphis. He bought 13.75 acres in 1957 for $102,500. Amazing! That might have been right after he got out of the army? Posted on December 24, 2014 February 12, 2016 Categories All (-ish), MailTags postcrossing1 Comment on Postcard from Graceland, by way of Texas. 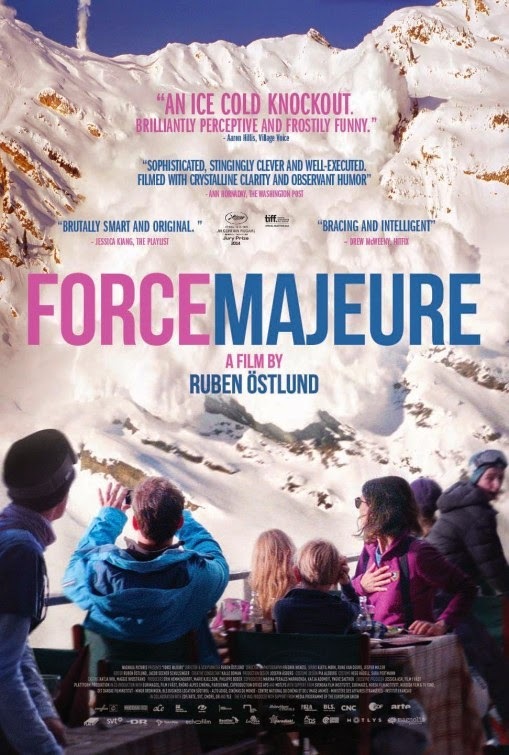 This is a quality movie in that it’s pretty, the acting is quite good and the plot (husband runs away from family when he thinks an avalanche is going to sweep over them) very interesting. However, it is a very slow and deliberate movie, giving the viewer a lot of time to take in all details in a scene. 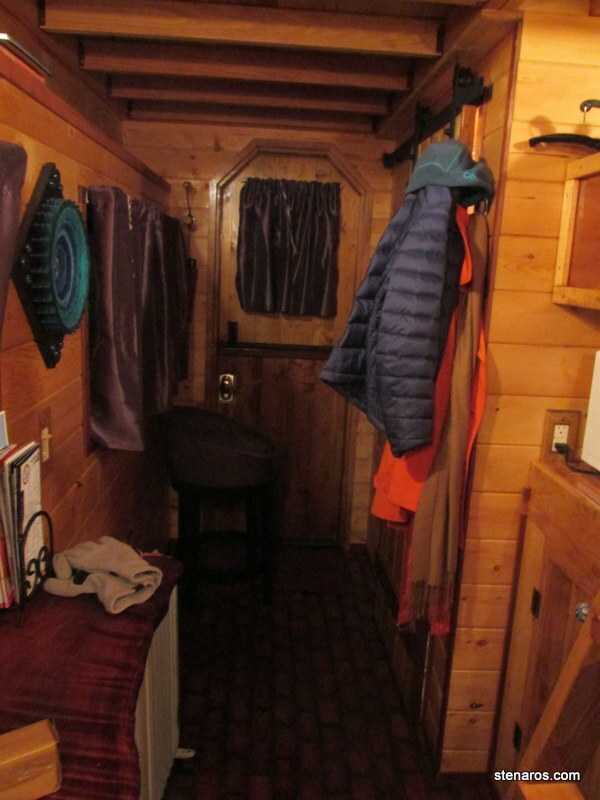 Aside from multiple scenes of teeth being brushed, I had ample time to contemplate the many ways of transporting skiers at fancy Alpine resorts. Where watched: Living Room Theaters, with mom.